I scored this beautiful round, mother of pearl mirror from TJ Maxx and few weeks ago. The main reason for this purchase was to cover up some wall warts, aka outlets, on our master bedroom wall. The outlets are intended for a mounted TV, but Jeff and I decided to not put a television in the bedroom. It was a good decision, but now we were left with two outlets smack dab in the middle of the wall. I said that this mirror was a score for three reasons. One, it was less than a $100. Two, it is 3 feet across, which fit the space and covered the outlets just enough. And three, its really beautiful and not just an average mirror. Finding the perfect mirror for the space was a win, but mounting it without it awkwardly angling down was the challenge. Secondly, a floating mirror gives a neat effect. In comes my Mr. Fix-it husband. He could have taken the easy way out and just put up a nail and hung it, but why do it the wrong way when it can be done right in three easy steps. Use any available scrap wood from previous projects, or your local hardware store scrap bin to create the "wall feet", aka the part that will rest against the wall. Cut them large enough to accommodate at least 2 screws. 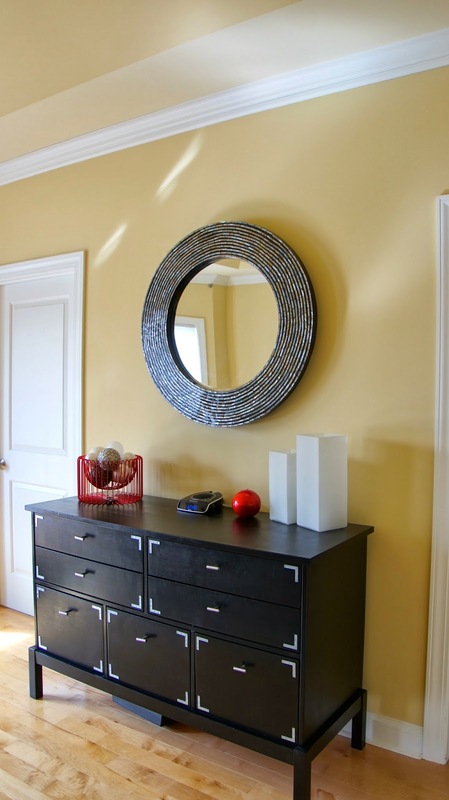 Make sure you use a screw large enough to go through the wall feet, but not too long that it penetrates all the way through the front of the mirror. You'll want to measure both the wall feet as well as the screw. Depending on the mirror, you may want to drill a small pilot hole just smaller than the screws so they don't split the material. For hook or anchor that's built in to the mirror, leave it, and you'll see below why. Using a similar size wall foot, using at least 2 screws, drill this directly into a stud on the wall. If you're lucky enough to have a stud in the right location, you can one of those screws to hang the mirror. We weren't and needed to put the foot slightly offset. We also didn't have long enough screws on hand so the holes are slightly recessed. Be sure to pre-drill every hole to make sure the wood doesn't split. The silver screw is what the mirror will actually hang on. I was applying touch up paint to the walls while he was doing the mounting, so I painted the outlet cover for the TV plug. The small area that is exposed blends right into the wall. The next time you go to mount something on the wall and it doesn’t sit flush, there is a fix. It takes just a few more steps to make it look professional.